Wine sheet design for Valentine Wine. I need a “technical sheet” on each winery. 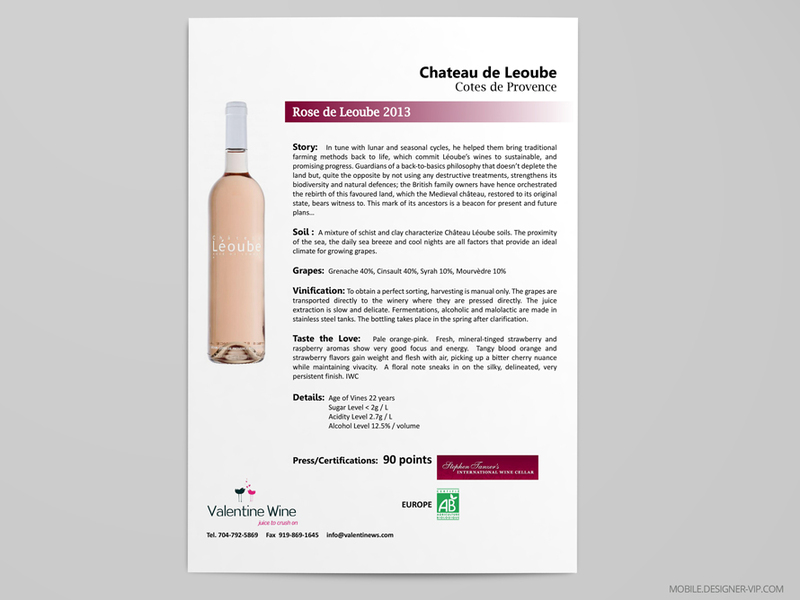 It need to be a visually interesting, modern and clean way to transfer information about multiple wines and our company. Soil: A mixture of schist and clay characterize Château Léoube soils. The proximity of the sea, the daily sea breeze and cool nights are all factors that provide an ideal climate for growing grapes. Vinification: To obtain a perfect sorting, harvesting is manual only. The grapes are transported directly to the winery where they are pressed directly. The juice extraction is slow and delicate. Fermentations, alcoholic and malolactic are made in stainless steel tanks. The bottling takes place in the spring after clarification. Created high quality wine sheet for a company with turn round – ~2 days. If you need a technical sheets designed for your company our studio can help.